I usually wait until Sunday to do the Project Tuesday Challenge, but things are different for the next few days. They call this a Joy Fold card, there are excellent instructions and once you have all your pieces cut and your designer paper cut in the right directions, it's easy to put together. My butterfly is cut from the paper I made from the previous card when I wheeled off the extra ink before I cleaned the wheel. I was so surprised when I finished this card to find that I had used parts of 5 stamp sets and I guess I should count the wheel. I hope the time pieces on the focal image convey, "It's time to get well." Supplies: Joy Fold Card, Papers: Stampin Up-Bravo Burgandy, Very Vanilla, K&Co-Terri Conrad Lovely Designer Paper Pad, Stamps: Inkadinkado-Butterfly/Time Collage, Stampin Up-Yummy, Charming, Clearly Wordsworth-Everyday Greetings, Autumn Leaves-Jounaling Tags, Stampin Up-Very Vintage jumbo wheel, Ink: Stampin Up-Rich Razzleberry, CTMH-Z2125 Grey Wool, Z2163 White Daisy, Cuttlebug Cut & Emboss-Butterflies, Michael's-black sticker dots. Great get well card such a clever looking fold, will have to check that out and great use of scraps! Thank you for sharing with us at TT this week. My goodness, Beverly, you are creating some beautiful card. This is another beautiful piece of work. I love the vintage look of it and that butterfly is gorgeous. 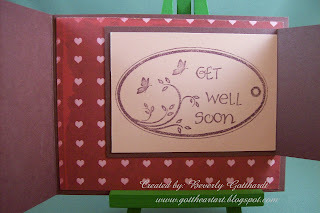 This card will be a lovely get-well card for someone. Happy to see you playing with us this week at the Creative Card Crew. Very nicd! 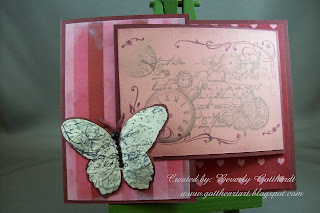 Thanks for playing along with my flutter by challenge! Wonderful get well card! Perfect for our challenge. I must try that fold. Thanks for joining us at TT this week! oo- fun and creative card!!!! Glad you joined us at Flutter By this week!!! so elegant! thanks for fluttering with us! Great card, love the fold. Thanks for joining TT this week. Very pretty! Thanks for playing at Flutter By Wednesday! It's such a beautiful card. Thanks for playing at TT this week. Beautiful butterfly!! Thanks for fluttering with us this week! Thanks for joining us Beverly, wonderful work. Such a pretty creation! Thanks for joining us at PT this week!